This month's Food 'n' Flix challenge is French Kiss - the 1995 movie starring Meg Ryan and Kevin Kline. The film was chosen by Food 'n' Flix creator Heather at All Roads Lead to the Kitchen - you can see her announcement post here, and you can take part any time this month. The premise of the film is that Kate (Meg Ryan) is flying to France alone, to confront her cheating fiancé; she is seated on the plane next to Luc (Kevin Kline), a thief who hides a stolen necklace in her bag. Which of course means that he needs to retrieve the necklace later, so Luc offers to help Kate win back her fiancé. They bond and Kate learns that Luc gambled away his birthright to the family vineyard but dreams of buying his own vineyard some day. I won't spoil what happens as Kate goes after her fiancé and Luc tries to sell the stolen necklace - you will have to watch the film yourself! I enjoyed the film even though it was a bit predictable and quite dated, but Meg Ryan is always good in a rom-com. Kate and Luc are having breakfast on the train of French bread and cheese and Luc tells her that there are 452 official cheeses in France; she tries some but is sick as she is lactose intolerant (presumably the cheese is worth it!). This means they have to get off the train part way, in what is Luc's home town and they stay at his family home, and this is where Kate learns about his dream to create a vineyard. When I was thinking about recipes to make, I kept thinking of tarte tatin - a lovely French tart that is cooked upside down in a pan using apples or sometimes pears, that I have made a few times and really love. I wanted to make something a bit different but the vineyard idea had put fruit in my head as well. I was visiting friends for new year's eve and had been asked if I could bring dessert. I made these chocolate brownies with candy cane frosting but wanted to make something that wasn't chocolate, and that my vegan friend could enjoy. (I would have made vegan brownies but was only using ingredients I already had in the house, and didn't have what I need). I found a recipe on Good to Know for French apple tart and decided to make it vegan by making my own pastry. What I love about this tart is that you have fluted apple slices on top which look appealing, but underneath a layer of sweet stewed apple. The combination of textures is amazing and it tasted delicious. First make the pastry, by sifting the flour into a large bowl and using your fingertips rub in the soya margarine to make a breadcrumb texture. Add a couple of tablespoons of cold water and mix by hand until you have a dough consistency. Form the dough into a ball and wrap in clingfilm; put the dough in the fridge while you make the filling. Cut one of the apples in half and peel four and a half. Cut the peeled apples into small chunks and put in a saucepan with the butter and 4 tbsp. water. Bring to the boil and simmer until the apples have softened; you may need to top up the water as you go. You don't want the mixture to be wet at the end, though you can drain it through a sieve if necessary. When the apples have softened add the 50g sugar (return the apples to the pan if you have drained them) and heat, stirring, until the sugar has dissolved. Leave the mixture to cool. Preheat oven to 190C. Roll out the pastry and line a 9-inch fluted tart tin. Line with greaseproof paper and fill with ceramic baking beans or raw rice and bake the empty pie crust in the oven for 10 minutes. Carefully remove the paper and the baking beans and bake the pie case for another 5 mins until golden brown. Spread the apple filling over the pastry base then peel the remaining apples. Remove the core with a corer or knife and slice the apples very thinly all the way around so you can fan them out over the top of the tart as shown. Sprinkle over the remaining caster sugar and bake in the oven for 20-30 minutes until the apples have turned golden brown. Serve warm or cold. I'm sharing this with Food n Flix as described above. 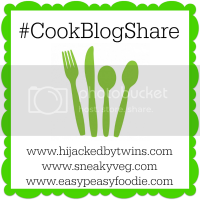 I'm also sharing this with CookBlogShare, hosted this week by Sneaky Veg. A tarte tatin and the vineyard scene sound like the perfect inspiration. This tart looks delicious, and I love the sound of the contrasting textures! Lovely Frenchified dish for the film! Perfectly inspired! That looks positively delicious, Caroline! What a lovely addition to our meal. This is a gorgeous tart. This looks delicious! Sorry you didn't love the movie as much as I did...I thought it was kind of nice to go back in time to the 90's! What a lovely taste tatin. I cannot wait to try it. I know my husband will love it.